Which of us who feels that they are a motor racing fan remembers Stephen South? Not too many I will wager! Even among hardened enthusiasts at Goodwood and Silverstone Classic his name elicited a frown and a “Oh, that name is familiar…BUT..” more often than not. This is exactly why this first-time effort by former automobilia dealer Darren Banks is such a welcome and needed addition to the book shelves. It tells, with none of the self deprecating “fluff” of Perry McCarthy’s “Flat out – Flat Broke”, the genuine story of one of his generation’s most naturally talented though ultimately unlucky racing drivers. 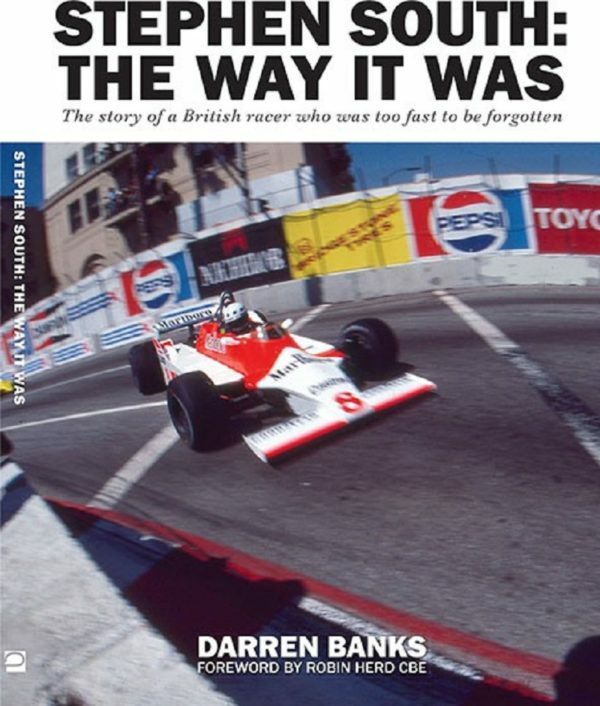 Darren has gained the subject’s trust and also been able to speak to so many of the contemporaries who were involved in Stephen’s rise and spectacular, accident-induced, fall from the higher slopes of motor racing’s “Everest”. The production of this book is, sadly, a little at the “reasonable” end of the scale; I believe it warranted a hard-back and larger print alongside the carefully researched images and well put together prose, but this is but a small criticism of what is a most worthy title, and a vital addition to any enthusiast’s library. Price: £25. 132 pages (270mm x 210mm), softback.